Here’s an example which highlights the importance of internal linking and the creation of hub pages. To demonstrate this, I’ll look at the Guardian and Mail Online’s SEO and internal linking strategy, and the marked contrast between the two. We’re looking at publishers here, but the principles apply equally to any website. In the run up to the tournament, most major news sites created World Cup hub pages for the term, which is likely to be the most popular of 2014. These hub pages gathered the World Cup content in one place, and should be the most useful for people searching on a generic term. Ideally, publishers would want these pages to achieve a consistently high ranking over time for the term, allowing them to direct users to other areas of the site. The screenshot below shows that, while the top few slots are taken by FIFA and Wikipedia (which would be almost impossible to shift), the BBC, Telegraph and Guardian all managed to rank on page one for ‘World Cup’. For these news sites, the pages that rank are their World Cup hub/landing pages, containing tables, fixtures, latest news, links to other related content, and so on. These pages allow the publishers in question to direct traffic to one page over time, allowing it to rank more consistently and make the most of the extra search traffic before and during the tournament. One major news site is missing: Mail Online (The Sun and Times are too, but we know why). It ranks so well for many other terms, so why isn’t it here? Given the sheer interest in the tournament (the spike peaks here around June 18) this represents a missed opportunity for the paper. 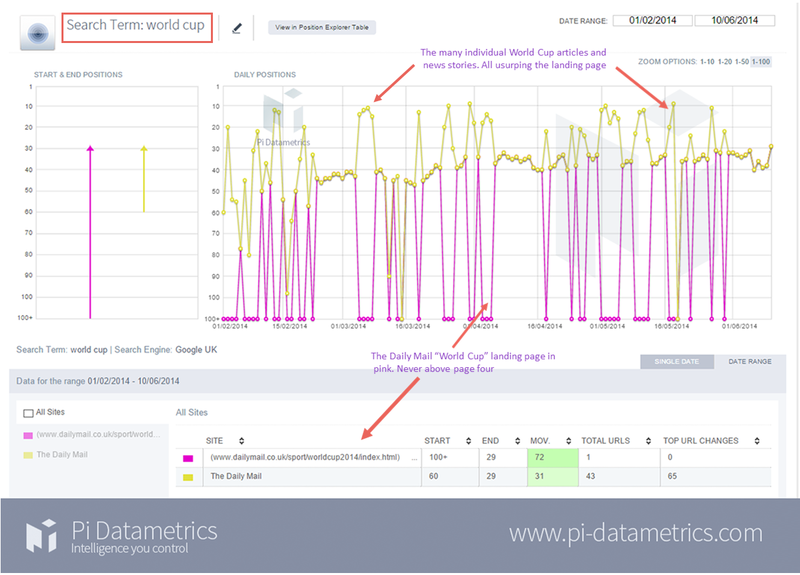 Using charts provided by the PI Datametrics SEO platform, we’ve looked at the Google rankings of the Mail and Guardian in the four months up to and including the World Cup. 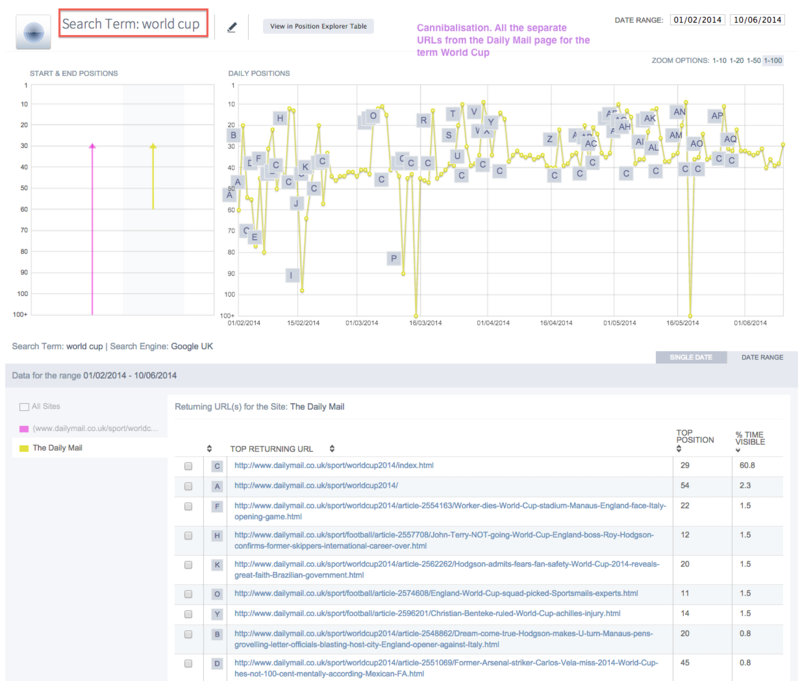 The results reveal the importance of a co-ordinated SEO strategy which uses internal links and hub pages, and explain how the Guardian and others succeeded where the Mail failed. The chart below shows the various pages on Mail Online which ranked on Google for the term ‘World Cup’ between February and June this year. 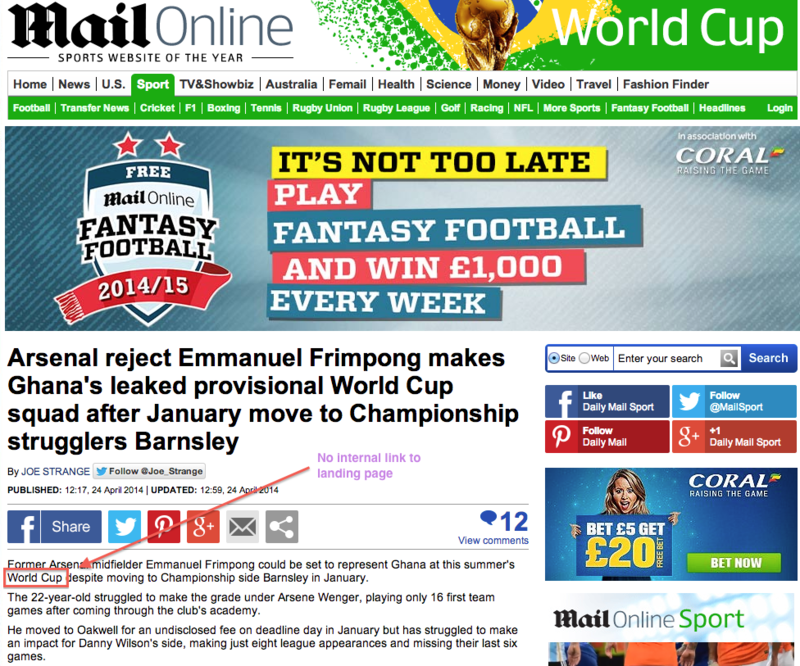 The page labelled ‘C” on the chart is the Mail’s World Cup hub page, which is the one the publisher would want to rank for consistently. 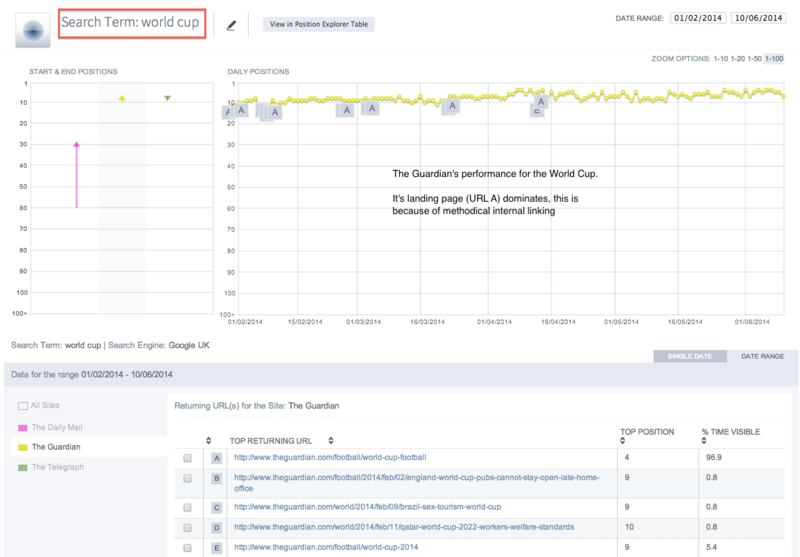 The chart below shows how the Mail’s Google rankings for ‘World Cup’ fluctuated over the four month period. Essentially, each new article published on the World Cup usurped the main landing page (shown in pink). This landing page didn’t manage to rank above page four on Google in the run-up to the World Cup which, as we know, is essentially nowhere. What’s happening here is that Google is seeing lots of pages from Mail Online for this search term, and is unsure of which one should be ranked the highest. Essentially, every new piece of content published on the World Cup is cannibalising the search ranking of other pages, and the hub page in particular. Mail Online is compounding the issue by failing to give any signal to Google to tell it which page it wants to rank for the search term in question. This has a lot to do with internal linking, or rather the lack of it. Mail Online could have linked back to the hub page from every article it wrote on the World Cup, which would have indicated to Google that this page was significant. However, despite many opportunities to link on that term (see below) the Mail didn’t do so. The upshot is that, though it had a useful World Cup hub page, it just didn’t manage to rank highly enough in the run up to the tournament. It is, of course, a very competitive term, but it wouldn’t be hard for a publisher with the resources of Mail Online to rank for this, given the right strategy. “What our intelligence shows is that The Daily Mail got the strategy right by publishing a landing page for the World Cup early in the year, but got the tactics wrong by not giving that page (and a subsequent canonical one) enough internal links and strength. So how did the Guardian succeed? It’s about internal linking. 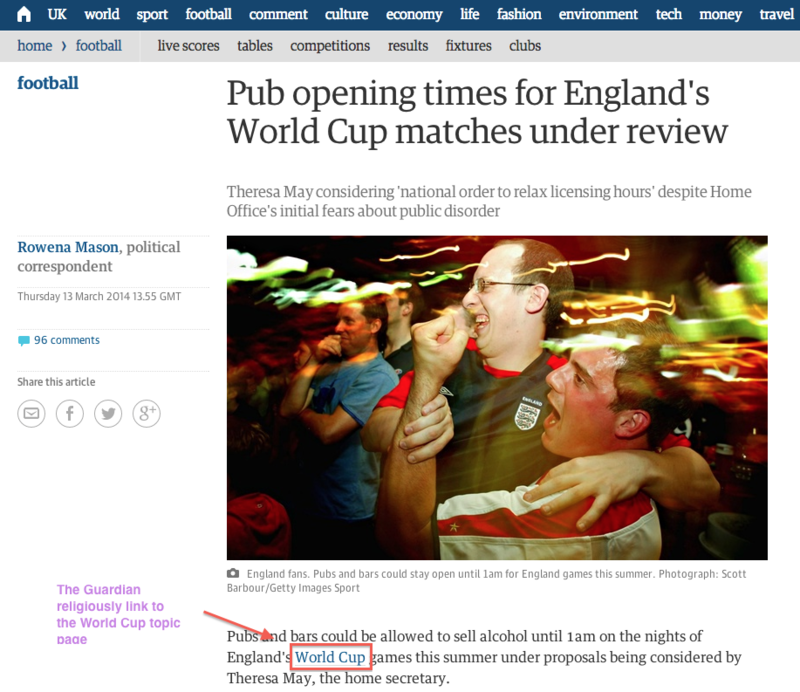 In contrast to Mail Online, the Guardian links repeatedly to its hub page from World Cup related articles. The publisher clearly had a plan in mind when it created the hub page, and all subsequent content on the World Cup worked towards this plan. Here we can see a link in the opening paragraph of the article. This pattern was repeated elsewhere, a tactic the Guardian uses with success for many other topics. In we look at the chart for The Guardian’s rankings for ‘World Cup’ over the same period as Mail Online one shown earlier, the effect is obvious. This is almost the complete opposite of the Mail’s chart. Its World Cup landing page dominates over all other pages on the site for this term. The Guardian also achieves a consistent page one ranking on Google, which would have made a massive difference to traffic on what would have been one of the most popular search terms of the year. Mail Online had the same opportunity to rank for this term. The difference is that The Guardian had a co-ordinated SEO and content strategy. The stats and charts shown here are revealing, and do back up some of our own strategy, while also showing areas where we can improve. We do place an emphasis on internal linking, to help and encourage our readers to explore other content and products that we offer, and also to help our SEO strategy. To this end, while we don’t have hub pages for all of the topics we cover, we do try to link consistently to one or two pages on a given term. For example, for a generic term such as ‘email marketing‘, we’ll link to our best practice guide on the subject as this is the page we’d most like people to visit (and ideally go on to buy the report). In other cases, perhaps where we have no obvious paid content, we’ll link to a particular blog article which we judge to be the most useful for searchers. The types of links used are important here. We do mix up the anchor text we use, and don’t want links to seem at all contrived. The overall lesson is that a co-ordinated linking strategy where articles are produced not just for SEO, but with Google in mind, allows the articles we write to be given the best possible chance of success. These examples highlight a potential problem for publishers and other sites (ecommerce for one) which create multiple pages and content on the same topics. The Mail example shows that publishing lots of articles around the same topic can have the effect of cannibalising search rankings from other pages on its site. The lesson here is not to stop producing articles, but instead underlines the importance of a clear content strategy which is executed with a firm eye on SEO. In this situation, and for generic terms like ‘World Cup’ hub pages are vitally important, as they allow publishers to rank more consistently. Every article serves to boost or sustain the rankings of the hub page for that particular topic. At the heart of this is an effective internal linking strategy in which writers and editors understand the SEO goals that the site is working towards. The rewards, for a high traffic term such as ‘World Cup’ are worth the effort. This is a lesson that websites of all types can learn from. Indeed, we’ve seen similar patterns from retailers, and our own site. This is something we’ll look into in future posts. The one with the hypnotically charismatic handsome guy with a terrible throw. The one with the blunt machete, bear suit and single best use of a swear word in any advert ever. The one you’ve seen highlighted at every single marketing conference you’ve attended since 2012. Digital marketing is a strategic priority for the telecom sector, with an average of 46% of total marketing budgets being assigned to digital. This statistic comes from our brand new Digital Marketing in the Telecom Sector report, produced by Econsultancy in partnership with Adobe. The report explores how companies operating in the telecom sector approach digital marketing, as well as the key trends, opportunities and sector-specific issues shaping their digital strategies. The insight is based on a global survey of more than 200 telecom executives based mainly in North America and EMEA (Europe, Middle East and Africa) and inside the downloadable report you’ll discover data around key business priorities in telecom, where companies are focusing digital marketing and technology, opportunities and budget plans for the next 12 months and obstacles to integrated marketing. I have found it virtually impossible to find credible Instagram accounts around marketing and digital topics, why is this? For someone who works in social media, I was restrained to get involved with the Instagram hype. Having been a Twitter user since near launch, I regarded them as fairly similar products and didn’t really want to condemn myself to even more social network hours a day. However, my love of food got the better of me and now, as an avid Instagrammer, I do not look back.